Our partnerships have lasting impacts on adult learning culture and student learning outcomes. 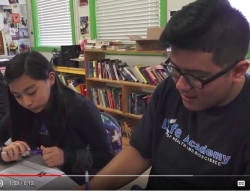 Through their partnership with Mills Teacher Scholars, Oakland Unified's Life Academy teachers gained tools, support, and structure to engage in collaborative inquiry to improve their teaching for long-term English Learners. 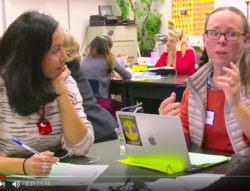 The teachers learned to see problems in their classrooms as opportunities for research, deepening their understanding of the teaching profession and empowering them to want to stay in the classroom and continue to build their inquiry community. With the support of Mills Teacher Scholars, San Lorenzo Unified's Colonial Acres teachers built agency and ownership over their learning. Through regular collaborative conversations with colleagues, they learned to surface the uncertainties that are inherent in teaching in confident, professional ways. Their focus on student data helped them deepen each other's thinking about student learning and implement effective changes to their teaching. 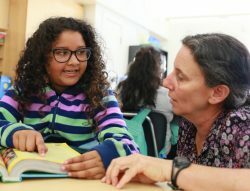 In partnership with Mills Teacher Scholars, a cross-district group of Oakland Unified teachers of newcomer English Learners used collaborative inquiry to support their students in developing their academic language. By interrogating multiple sources of classroom data that made their students' learning visible, they learned to derive their own solutions to problems of practice. Our work has an ongoing impact on adult learning culture and student learning outcomes at our partner sites. From boosting teacher retention to supporting students' progress toward learning objectives, collaborative inquiry is helping to bring about transformational change.